Over 2000 Color-A-Thon events nationwide. In the same spirit of good will and celebration, School-A-Thon presents Color-A-Thon™. Your Color-A-Thon is a fun and happy way to raise money for your school or group that ends with a celebration of music, laughter and the throwing vibrant, safe color dust in the air. School-A-Thon® takes the health and safety of all of our participants seriously. Our Color Dust is non-toxic, 100% safe and is bio-degradable. It is NOT meant for consumption. As with any substance, you will want to keep our color dust out of eyes and lungs. Although we have never had any issues in the past, people with allergies and/or asthma may want to take extra precautions when it comes to the Color Dust. The particals are extremently small which is an important factor for people prone to allergy and who have asthma. 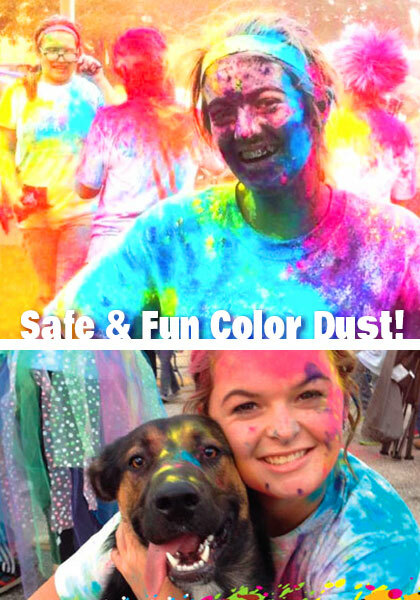 We suggest that participants with allergies or asthma wear protective masks and/or keep a safe distance from the Color Blast Party and from the Color Blast Stations during the event. We caution parents to evaluate their child’s tolerance to dust and make appropriate decisions. For all participants we suggest that they wear some type of eye protection such as glasses or goggles. As part of the Color-A-Thon Rewards program, sunglasses are provided at a very low donation level. We also suggest that a mask, kerchief or some type of covering over the mouth and nose be used to minimize any excessive inhalation of the color dust. School-A-Thon can provide schools and groups with protective masks at a very low cost if your committee believes it is necessary. There are up to 4 pre-determined Color Blast Stations along the event route. Each is managed by 2 adults. Color Dust is NOT shot at participants with any type of “gun” or shooting mechanism. Powder is tossed gently and in a controlled manner by the 2 adults at each pre-determined Color Blast Station using a small paper cup. Your Color Dust Throwers along the route should be instructed to toss the color dust at participants’ body (chest down) and not to toss in the faces of participants. We have had zero fire-related incidents in all of our Color-A-Thon events and are committed to providing a safe, fun event for schools and groups across the nation. 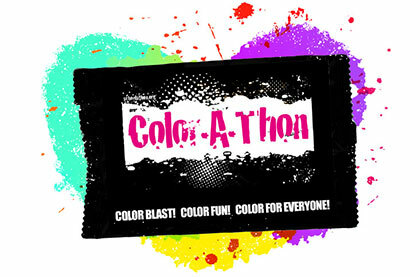 The powder used in the incident in Taipei was different from that used in all Color-A-Thon™ Events and was not provided by the Color-A-Thon™ supplier. Most Color-A-Thon events do not generate sufficient colored powder and cloud dispersion in the presence of air to create a fire hazard because they are much smaller compared to other widely known color events. Have a Color Dust Blower station set up where volunteers are set up to blow the excess color off of participants. A leaf blower on the lowest setting works great! Instruct parent/guardians/carpool drivers to bring old towels to lay on the seats of vehicles for the trip home. The color mostly washes out after events. Wearing your white Color-A-Thon™ t-shirt is not only fun but it keeps your participants from ruining “good” clothes. We suggest shaking and blowing off as much Color Dust as possible before climbing into the shower. Brush hair vigorously to get as much dust out as possible. Thoroughly wash hair and body with soap and water. Hair may have to washed twice. If hair is light colored, we suggest putting in conditioner to “coat” hair and prevent any discoloration. If hair does become “colored”, it should wash out after two or three shampoos. Color-A-Thon events use a minimal amount of color and so has a minimal environmental impact. About 25 pounds of bulk Color Dust is shipped to each event. The Color Dust is not harmful to wildlife or vegetation. Use leaf blowers to blow excess color dust off of walkways and to prevent the color dust from being tracked into buildings. If the Color Dust does get tracked into buildings, use a dust mop to clean floors. A shop vac can be used to pick up large amounts of Color Dust.